How do you get rid of the rust marks encrusted in glass-fibre? The best way is to use our “Starbrite Rust Stain Remover. All you have to do is spray it on the stain, leave for 3 minutes, then rinse. If the mark persists, repeat the operation. It can be used on the hull, deck, etc. I got yellow stains on the hull how can I get rid of them? No, a shampoo is too mild and will not have any in-depth effect. You need to use “Star brite Hull Cleaner” Ref. 81732 which will remove these yellow stains and other brown tannic stains. Spray the product onto the hull, spread it using a sponge, leave it to act for 1 or 2 minutes then rinse thoroughly with water. Repeat the procedure if the result is not totally satisfactory. How can I clean the waterline without using aggressive products? Just spray “Star brite Hull Cleaner” ref. 81732 on the waterline, spread it out with a sponge, leave it to act for 1 or 2 minutes and rinse well. Does the hull need protecting after an in-depth clean with Hull Cleaner? Yes, it is highly recommended to protect the hull to avoid the rapid reappearance of stains and to remove the slightly dull aspect caused by the application of the Hull Cleaner.The best solution is to use “Star brite Premium Marine Polish with PTEF®” ref. 85716 which is pure protection, polishing the hull to a shine and protecting against UV light, salt and bad weather conditions. Very easy to apply, it can even be used in full sunlight! How long does Marine Polish with PTEF protect the surface? Our Star brite Marine Polish with PTEF® is effective over very long periods of time, which can be up to a year. Ideally, apply the product once at the start of the season before putting in the water and once before wintering. What surface area can be treated with one 500ml bottle of Polish with PTEF? As with the other Star brite Polishes, you can treat the hull of a boat of up to 7 m with a 500 ml bottle. Star brite Premium Marine Polish with PTEF® also exists in 950 ml bottles, ref. 85732. How can I remove the black streaks encrusted along the hull? A special product is available for removing black streaks due to rainwater collecting dirt and grime which are encrusted in the gelcoat along the hull: “Star brite Black Streak Remover” ref. 71622. This product acts deep down without altering the surface and preserves the shine of the hull, even when polished. Spray the product along the black streaks, leave for a minute and rinse thoroughly with water. Repeat if the first application does not yield satisfactory results. Is Starbrite Black Streak Remover effective on exhaust fume marks? Yes, the product is also effective on marks made by exhaust fumes. 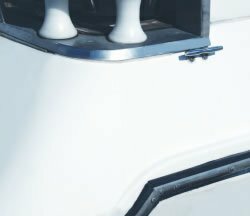 How do I know whether to use a polish or a cleaner on the hull of my boat? If the hull is dirty, with yellow or brown encrusted stains, or has not been maintained for a long time but shows no major signs of dullness or oxidation, use a strong detergent with in-depth action that does not alter the glass-fibre such as “Star brite Hull Cleaner” ref. 81732 or “Star brite Wash and Wax” ref. 89632. These 2 products clean the surface perfectly and restore its original appearance. If the hull is oxidised and/or powdery, dull or faded, polishing is then necessary and more abrasive products should be used. Your catalogue presents a number of polishes and I don't know which one to use. How do I select the one that I need? If the hull is oxidised, powdery or faded: after a good clean with “Star brite Boat Wash” ref. 80416, use an abrasive renovating polish, i.e. “Star brite Fiberglass Color Restorer” ref. 81816 to revive and deoxidise dull hulls, or “Starbrite Liquid rubbing Compound” ref. 81316 to deoxidise in depth and revive white hulls. After this restoration stage, if possible wait for a fortnight to one month before applying a protective polish, ideally “Star brite Premium Marine Polish with PTEF®” ref. 85716.If you have less time available, or if you wish to limit your expenses, you can use “Star brite Marine Polish” ref. 80116 which cleans, deoxidises, revives and protects all in one. It is a very effective product. I've got mildew stains on the cladding. What must I do to remove them? Starbrite Mildew Stain Remover” ref. 85616, which is very effective and removes the stains on contact and especially prevents the bacteria reappearing after a few days as is the case with most common stain removers! One treatment every 6 months in sensitive areas is sufficient. In theory the product presents no danger to fabrics. It is preferable to try it on a small area of fabric before application. Is there an effective product for removing fish blood stains encrusted in vinyl cushions? Yes, “Starbrite Vinyl Shampoo” ref. 80216. This product, which is used like an ordinary shampoo neat or diluted, has the particular property of even removing stains which are encrusted in the material. It acts in a few seconds and does not alter the surface at all. How can I remove numerous bird droppings on the deck and the boat cover? Either with a product which is effective on both deck and fabrics, “Star brite Black Streak Remover” ref. 71622, or using that product on the deck or any other part of the boat whatever the surface, and “Star brite Boat Cover Cleaner” ref. 92122 for the covers. How can I effectively clean a non-slip deck covering? Star brite offers a ready-to-use product, which cleans in depth in cavities and without altering the surface; it requires no scrubbing and leaves a layer of protection against UV light and dirt. This product is “Star brite Non Skid Deck Cleaner” ref. 85932.Spread the product over the surface, leave to act for one or two minutes, brush lightly using a good deck washer and a soft brush such as Star brite 40150 and rinse with water. Is Non Skid Deck Cleaner effective for TBS maintenance? Perfectly. Tests were even carried out a few years ago at the TBS factories and gave excellent results. TBS recommends “Star brite Non Skid Deck Cleaner” to its customers. Why should I use a special boat wash rather than a far cheaper household product? Household products are not effective in the varied conditions found in a marine environment. For example, a household product will have no effect on contact with sea water. 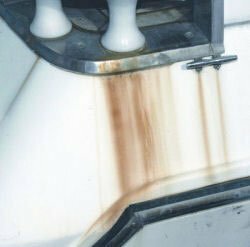 In addition, household products always leave marks on hulls or smooth surfaces when dry, which is not the case with “Star brite Boat Wash” ref. 80416. Its highly concentrated formula (2 capfuls of Boat Wash for a bucket of water) mean a minimum of rinsing whether you use fresh or sea water. Can Boat Wash be used regularly with no risk of damaging the protective polish coat? Yes, certainly. Using “Star brite Boat Wash” even on a daily basis does not alter surfaces, even when polished, in any way whatsoever. I'd like to use StarTron when I fill up the tank, but having used other additives before I'd like to know if Star Tron is compatible. Star tron is compatible to any kind of additives you have used previously without any danger. © 2019 Starbrite Africa. All Rights Reserved.